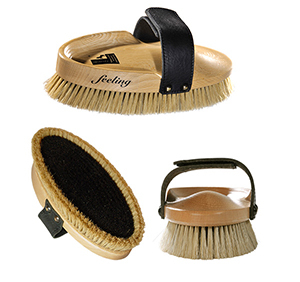 The variety and sheer volume of horse brushes available on the market cover such scope and magnitude, we could go on forever about which style brush is best for what type of grooming. But choosing the right tools is about personal preference as well as addressing specific grooming requirements. With this in mind, we have a full cross-section of brushes and combs to meet all of your grooming needs. After all, the point is to enjoy grooming your horse-it should be a relaxing, enjoyable, and rewarding pastime, both for you and for your equine friend. Beastie Brush: as the makers say, “Animal Care with a Flair!” Funky brushes in bright, one-of-a-kind colours (no two brushes are alike in a box). Available in adult and junior sizes. We encourage the budding equestrians in your family to help out with the chores, and we offer many of our brushes in “junior” sizes for smaller hands!